Forge of Empires is a browser based free to play city strategy game that allows its players to build up a mighty civilization and battle it out for ultimate control of the continent and command your sprawling empire and now you can play on iOS and Android devices. Starting from the Stone Age and working your way through the different eras of our own history, your empire will advance through the epochs unlocking new technologies that yield improved buildings, units and ways of life. Crafting your own city and placing down buildings and roads is but the start of your journey, expanding your empire will require trade, diplomacy and maybe even military campaigns against your rivals. 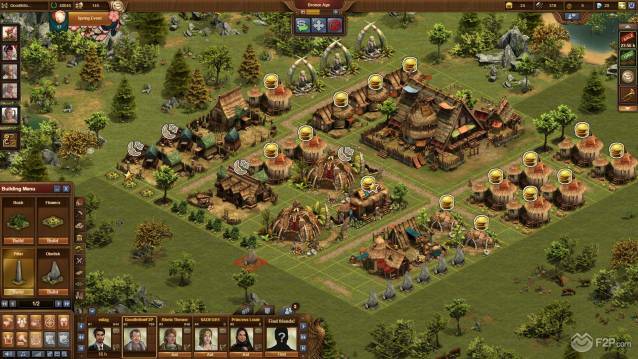 Forge Empires is a Cross-platform MMO Free2Play game. Players get full control over the layout of their cities, choosing where certain buildings will be placed and locations of roads, from city housing to increase your population and income, to decorative cultural buildings to keep your populous happy and working efficiently and workshops for gathering resources and crafting. There are a whole host of different buildings available that will upgrade as you progress through the various ages, placement of each building costs both gold and resources and managing your resources efficiently is paramount to a successful city. As you advance through the eras your buildings will upgrade and change the look of the building to represent the age your civilization has reached. Building a workshop will enable you to choose which resource you wish it to focus on gathering. Your choices of resources are dependent on the era you are in and the technologies you have unlocked, starting in the Stone Age you are able to focus your workshops on gathering animal bone and teeth to make basic tools and weapons, whereas later in the game you will be able to mine iron and other minerals. Another “resource” is your populous’ happiness that you must keep track of, building decorative structure will improve their happiness increasing their productivity, an unhappy people builds much slower than normal. The game features and extensive technology tree going through historic eras starting with Stone Age technologies and currently up to Late Middle Age (though plans are to have the game go into the future eras with futuristic technologies). By spending research points that are earned every hour you can progress your civilization by learning a new technology in the tree, to unlock certain later technologies there are pre-requisite technologies that must be learned first, but the extensive tree gives many different paths that players can focus on. By moving around the continent map you can scout out new provinces and try to conquer them with your military units, one of the earliest units gained being the javeliner. When finding a new province there is typically a ruler already in place, by clicking on the province you can see the defending units available in the area and weigh them up against your own army. There is the possibility of making negotiations with newly met rulers or infiltrating their province; alternatively you can attack them. When combat begins you are able to choose which available units from your army are going to attack and then a new tiled hex grid map opens up. The map is decorated with different terrain features such as rocks, trees and hills which offer defensive and offensive benefits. Each unit enters a turn queue, as opposed to being able to move all your units and then the AI or other player moving all their units, and the first side to lose all their units (or surrender) is defeated. Conquering all the provinces in a zone will give you access to the provinces resources. It is possible to visit other players’ cities and help them out; giving them small benefits to production or happiness and in turn receiving a small bonus yourself, an excellent feature for guilds who wish to help each other’s cities thrive. The premium currency in Forge of Empires is Diamonds, a premium resource that can be bought with real money and used for pretty much anything within the game from reducing time to build a unit or building, buying unique buildings available only with the Diamond resource and buying Forge Points used to advance your research and much more.